From Thursday 5th to Sunday November 9, 2014 the Teatro Central in Seville will host a new edition of the series Jazz in November. 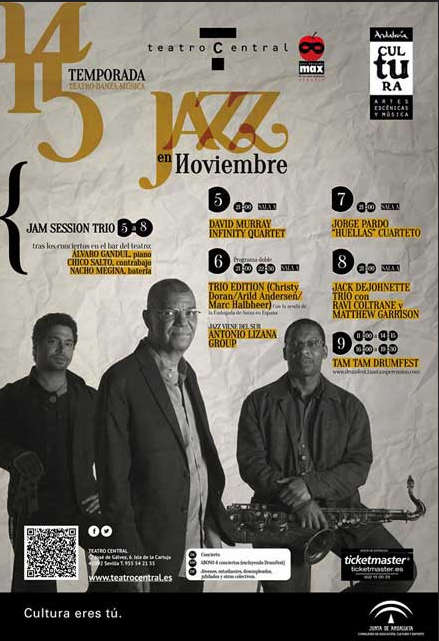 The Jazz Festival will be held at Teatro Central in Seville (Spain) and the groups confirmed are: David Murray Infinity Quartet , double bill with Trio Edition and Antonio Lizana Group, Jorge Pardo Cuarteto and Jack DeJohnette Trio featuring Ravi Coltrane and Matthew Garrison. Plus every night after the show a Jam Session at the Theatre bar. Learn more here.